We all know the traditional way an account is related to contacts. It’s a one-to-many relationship. However Salesforce recently redefined the way you can relate a contact with accounts in the last summer ’16 release. So, this new relationship has been a big boon to many sales reps who used to face a tough time to relate a contact with multiple Businesses/Accounts. Yes, so now you can relate a contact with multiple accounts. Also, if you still want to live the old way of relating a contact with just one account, you can continue to do so because this new relationship will be enabled only if you choose to do so in the setup. An important point to note here is that, when you relate a contact to multiple accounts, you still need to have a primary account defined against that contact. This account will be defined in the “Account Name” field and this relationship is called as a direct relationship. Apart from this direct relationship to a contact, you can have many more accounts defined against a contact and this sort of relationship is called as “Indirect relationship”. In the relationship shown below, the relation between Contact and Account1 would be called as direct relationship and the relation between contact and the other 2 accounts are indirect relationship. Let’s go ahead and see how do we actually set this up in Salesforce. 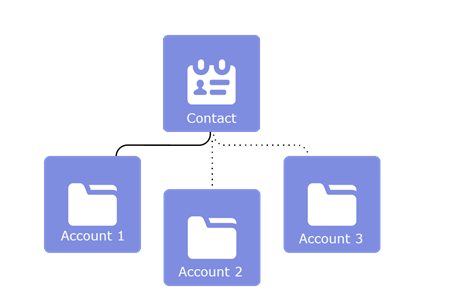 What needs to be done when a user deletes an account that has direct contacts that are related to other accounts. What happens when the user replaces the primary account on a contact record. It’s ideally recommended to keep the default settings as shown above. Now, we also need to change the way activities are rolled up into an account from a contact. Go to Setup > Activity Settings and uncheck the below checkbox. 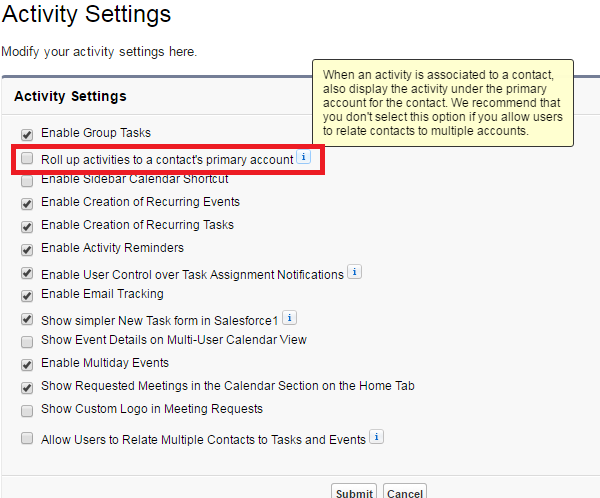 This will ensure that activities not rolled up to a primary account from a account. We need to ensure this since all the activities associated with a contact may not necessarily be related to the primary account. So, all that we are left to do now is to change the page-layouts of account and contact to ensure that the new related lists are displayed on them. Since, we have the contact to multiple accounts relationship enabled, we will now have to show a different related list in each page layout. Click on the Related List and drag and drop the “Related Contacts” to the page layout. On a similar note, add the Related accounts related list to the page layout of Contact. So, now we are all set to start using the new relationship. Let’s check out and see how it works. We have two accounts named as “ABC Corp Inc.” and “Universal Corp Inc.” and a contact named as “Mark Brown” who collaborates with both these companies. “ABC Corp Inc” is the primary account for “Mark” and “Universal Corp Inc” is the secondary account. So we will now relate mark to both these companies. Go to the Contact’s tab and create a new Contact record with the Account lookup linked to “ABC Corp Inc.” You will see that the account has automatically become the primary account for this contact and it has the “Direct” flag checked which means that it is a direct relationship. Now to add the other account to the same contact, click on the “Add relationship” button show above and select the “Universal Corp Inc.” account to be added. You will then see that both the accounts are now related to the same contact under the related accounts section. However, this time the “Direct” checkbox will be left unchecked which means that it is an indirect relationship. Previous Previous post: How to automatically close a case when a closure email is sent to the customer ? Next Next post: How to add business days to a date in Salesforce formula ? Thanks for the feedback Ayan ! Good Explanations. it’s really Very useful, Can u please make a post related to this how to Import data through data loader for contacts with multiple accounts. Thanks for the feedback Vishnu, Yeah I will definitely add that to my pipeline !